Minimalist outer appearance conceals expensive photo equipment. 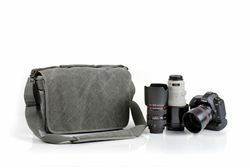 Carries a pro size DSLR with standard zoom lens attached. Wider size to fit a 70-200 f2.8 attached to DSLR facing sideways. 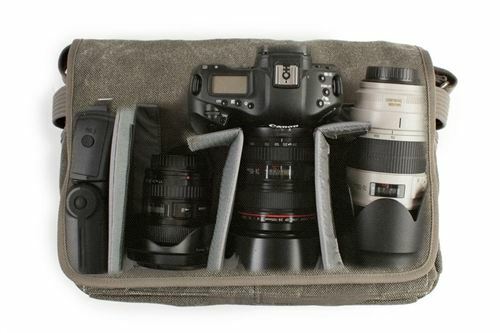 Accommodates 2-4 lenses in main compartment with 2 DSLR bodies in front pockets. 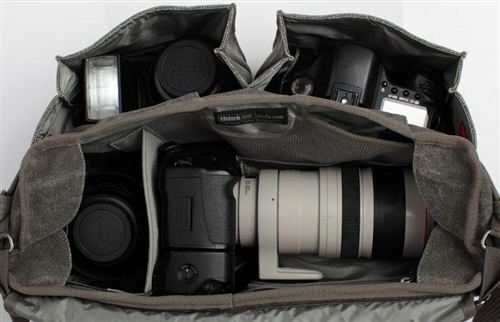 Two front pockets to carry pro size DSLRs (bodies only). Organizer pocket built into main compartment for pens, note pad, batteries, etc. Hook and Loop Sound Silencers on the front flap eliminate noise while opening the bag. Soft, adjustable shoulder strap with cushioned non-slip pad. Clear business card holder under front flap. Removable short carrying handle for convenience. Seam-sealed rain cover included for protection against the elements. Black (1100D 'polyspun' polyester exterior fabric), Pinestone (sand washed cotton canvas) and Blue State (sand washed cotton canvas).